Click here for Capt. Jim Williams' Flaming Gorge Lake Trout fishing report (archives). Click for an interactive map of Flaming Gorge. 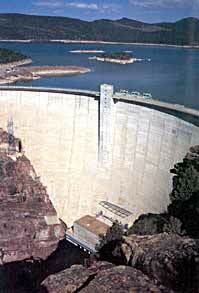 Flaming Gorge Reservoir was created in 1962 by impoundment of the Green River behind Flaming Gorge Dam. Located in northeast Utah and southwest Wyoming, the reservoir is 91 miles long and covers 42,000 acres. Facilities within the Flaming Gorge National Recreation Area include 18 U.S. Forest Service Campgrounds (four boat campgrounds), nine paved boat ramps, and three full service marinas. Since impoundment, rainbow trout have been annually stocked in Flaming Gorge and provide the bulk of the harvest, as well as being the most sought-after species by anglers. Kokanee Salmon and smallmouth bass were stocked during the mid 1960s and have since developed naturally reproducing fisheries. After rainbow trout, kokanee are typically second in harvest and popularity with anglers. Lake trout, or "mackinaw," which drifted into Flaming Gorge from the upper Green River drainage, have also become established as a wild population. 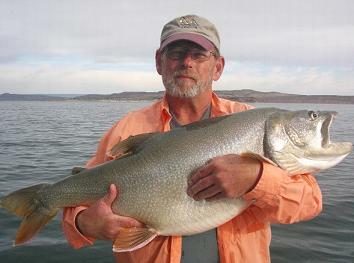 Lake trout are managed as a trophy fishery in Flaming Gorge. Regulations are designed to keep lake trout numbers in balance with populations of kokanee salmon and Utah chubs, their primary prey. Other sportfish occasionally stocked in the reservoir include brown trout and channel catfish. A 41 lb. Lake Trout caught by an angler fishing with Capt. Jim Williams (www.fishflaminggorge.com). Flaming Gorge has become a premiere trophy lake trout water, with fish over 50 pounds setting both Utah and Wyoming state records. Lake trout are difficult to catch, and the average angler can expect to put in many hours between fish. During the early spring and late fall months, cool water temperatures allow lake trout to venture anywhere in the water column. At these times, a good technique that doesn't require specialized equipment is longlining a #9 - #13 Rapala, Shad Rap, T-50 Flatfish, or similar lure behind a boat. Shoreline areas including points and shallow dropoffs, as well as open water over traditional lake trout runs, may hold fish. Popular lure colors include perch-scale, frog, white, chartreuse, and black/silver or black/gold combinations. During the summer months and generally under the ice, lake trout can be found at 70 - 120 feet depths associated with structure, which might include points, river channels, ridges, or other dropoffs. One popular summer technique is dragging the bottom with steel line using a Flatfish or Flasher and minnow combination. This requires saltwater sized rods and high capacity reels. Downrigger fishermen do well with the above-mentioned lures trailing 50 - 100 feet behind the weight, with depth adjusted to keep the lure off the bottom. Another popular downrigger method is a plastic squid placed 18 inches behind a large dodger or flasher, with the flasher 3 - 4 feet behind the weight. This distance should be adjusted so it combines with boat speed for good flasher action. A depthfinder is critical to keep the weight from snagging bottom. Good areas to try for lake trout include Mustang Ridge, Jarvies Canyon, Hideout, Linwood Bay, Antleope Flats, Stateline, Anvil Draw, and Big Bend. (See Map of Flaming Gorge). A final lake trout technique is vertical jigging, both from boats and through the ice. Large .75- to 1.5-oz. leadhead jigs with marabou, bucktail or plastic skirts or tails, such as Mac Attacks or Mister Twisters, are popular. The jig is often tipped with a minnow or sucker meat, which is especially effective during winter. Large spoons, BuzzBombs and Kastmasters can work, but remember with any jig to keep the lure bouncing right on the bottom. Jigging through the ice is very effective and doesn't require specialized equipment. Ice forms at the Confluence area by early January, and hot fishing often results from following the formation of ice south as winter progresses. During winter, there is a movement of lake trout as far north as the Confluence, while late summer finds most fish south of Anvil Draw. Because of this migration, Currant Creek and Big Bend provide good fishing early in the spring, while Linwood Bay continues to get better as the summer progresses. For a great expert guide for Lake Trout at Flaming Gorge, you can contact Capt. Jim Williams. He's an excellent guide and has great service. His website is www.fishflaminggorge.com. Rainbows are found throughout the reservoir are usually become active during April as ice recedes and water temperatures warm. During spring, rainbows are readily caught from shore using a worm/marshmallow combination; cheese or powerbait; medium-sized spinners, spoons, or rapalas; and 1/8 to 1/4 oz. brown or black marabou jigs. On the south end of the reservoir, try fishing a worm 3 - 4 feet under a bobber (a great technique for kids). Fly fishermen do well with Wooly Bugger, leech, shrimp (scud), or Renegade patterns fished with a sinking tip, sinking line, or 5 - 6 feet behind a clear plastic bubble on spinning gear. Good places to try include Flaming Gorge Visitor Center, Mustang Ridge, Sheep Creek, Linwood Bay, Antelope Flats, Anvil Draw, South Buckboard, Breeze Hill, Sage Creek and the Confluence. (See Map of Flaming Gorge). Boat fishermen do equally well during the spring trolling along the shoreline in these areas. A Flasher and worm combination long-lined on monofilament is the most popular terminal tackle, but Jake's Spin lures, size F6 flatfish, #5 - #7 rapalas, Shad Raps, Super Dupers, and other medium-sized spinners and lures can be deadly. Warm water temperatures drive rainbows into deeper water during summer and early fall months, making shore fishing less productive. Boat anglers still catch rainbows on the same lures using leadcore line, downriggers or extra weight on their monofilament line. Fishing picks up again in the fall, and some areas like Jarvies Canyon, Carter Creek, Sheep Creek, Linwood Bay, Squaw Hollow, Big Bend, Halfway Hollow and Firehole, may provide their best rainbow fishing of the year. Boat fishermen on the north end of the reservoir will	have their best action working the mouths of bays with rapalas and Shad Raps. As Flaming Gorge freezes, rainbow trout fishing may be good in 1O to 30 feet of water. Try small jigs, spoons or ice flies tipped with a salmon egg or a piece of worm. Power bait and night crawlers also work well. Kokanee salmon spend their four-year lifetime feeding on zooplankton that average one millimeter in length. They don't strike a lure because it resembles food, but rather for its action and color. Effective lures at Flaming Gorge are 1 - 2 inches long in fluorescent orange, chartreuse, pink, silver, gold or white. Popular styles include Needlefish, Super Dupers, Krocodiles, Triple Teasers, and Kokanee Kings. The most popular method is trolling these lures using a downrigger. If kokanee are aggressive, fish the lure 12 - 18 inches behind popgear or one of the smaller-sized flashers or dodgers. If the fish seem finicky, trail the lure farther behind the downrigger weight without an attractor. Either way, kokanee at Flaming Gorge like the lure traveling fast, so keep boat speed at 2 - 3 mph. Another technique that works is vertical jigging with Kastmasters, BuzzBombs, Crippled Herrings, or leadhead jigs in the described colors. The main trick to catching kokanee is locating them and fishing at the proper depth. By May or early June, kokanee action picks up with the fish suspended 25 - 30 feet over deep open water or "pelagic" areas. As the summer progresses, kokanee move deeper, and by August may be at 60- to 70-foot depths. A depthfinder or "graph" is invaluable for locating fish, then either a lead-core line or a downrigger is necessary to hold the lure at proper depth. Without a graph, work deeper intervals until fish are located. Kokanee travel in schools, so it pays to make several passes through an area where one fish is caught. Kokanee concentrate in different specific locations every year, but consistent producers include Cedar Springs, Jarvies Canyon, Hideout, Red Cliffs, Horses hoe Canyon, Pipeline, Wildhorse, Squaw Hollow, Lowe Canyon, and Big Bend. As the fall spawning season approaches, mature kokanee concentrate or "stage" adjacent to spawning areas, which include Sheep Creek, Wildhorse, Squaw Hollow and Lowe Canyon. (See Map of Flaming Gorge). Channel catfish are found in the north end of Flaming Gorge, generally upstream of the Confluence in the Blacks Fork and Green River arms. Most large catfish are caught on fresh, whole dead minnows fished on the bottom, while worms are a good choice for smaller fish. Ice goes off the Blacks Fork arm first, and this area usually provides good fishing from April to early June. Action in the Green River arm picks up later, but lasts longer into the summer. In either location, a good bet is fishing the transition zone between the flowing river and standing reservoir water. Concentrate angling efforts between sunset and midnight, then again just before sunrise. Smallmouth bass are found in rocky shoreline habitat throughout Flaming Gorge Reservoir. A dense population dominated by smaller-sized fish exists from the dam north to Linwood Bay. From Antelope Flats north, fewer bass are found but growth rates are greater. Smallmouths in Flaming Gorge feed almost exclusively on crayfish, so jigs and lures that imitate crayfish size and color are especially effective. Spinners, spoons, nightcrawlers, and flies such as leech or streamer patterns also work. Smallmouths spawn from late May through early July, and during this period mature fish move into shallow water where they are easily reached by lures, jigs and crankbaits. As summer progresses, bass move deeper and are best reached by retrieving a jig slowly along the bottom. Try working points, ledges and rocky slopes by casting toward shore and stepping the jig into deeper water. Smaller bass inhabit shallow water throughout the summer, and can be taken with worms or small lures. Don't hesitate to harvest these stunted fish, which can improve growth of the remaining population. Besides, smallmouths are great table fare and kids love catching them. Like smallmouth bass, crayfish are found in rocky habitat throughout Flaming Gorge, usually at depths less than 20 feet. Crayfish can be caught with a variety of minnow-type traps baited with meat, fish or offal, or simply a strong line with a chunk of bait tied on the end. Throw the bait out into a likely area, wait a couple of minutes, then pull it in smoothly and quickly. In the Utah portion of the reservoir, crayfish must be killed before transporting them from the water. Crayfish, like all shellfish, spoil	easily and should be cleaned and iced if not immediately cleaned and cooked. Crayfish are great eating, and can add variety to your Flaming Gorge fishing experience.